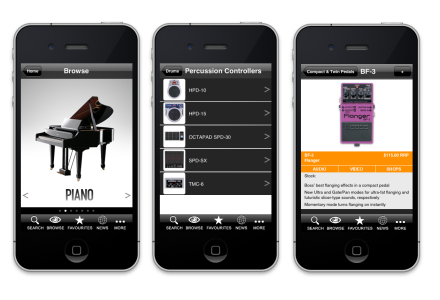 Developed for Roland, manufacturers and distributers of musical equipment worldwide, this iphone app development project has involved designing and developing an interactive app using rich media such as audio and video data to allow their sales staff to showcase their entire product base of approx 2,000 products. Products are searchable by product name/number or the user can browse down through 4 sub category levels until they reach the product they want to showcase. We then offer detailed product information including price, a short description, long description, mutiple product images, quick time audio clips and streamed video demonstrations played using the in-built YouTube player. We also offer location based services to help locate the nearest dealer with stock, news and promotional articles, a favourites section, linked product accessories, and secure services to show Roland staff only, the latest financial and stock data. Developed using C++ in an Xcode environment, this app uses many web services/XML to pull information from the website database to the app to provide up to the minute data. Thus all the iPhone app navigation and content is dynamic and being driven by webservices.